As much as the Gonzaga Bulldogs basketball teams are known for their tournament success and total dominance of the West Coast Conference, their home court advantage has also been a notable part of their multiple decades of excellence. That advantage has come in large part due to the rowdy and loud nature of the Kennel Club, the school's student section — one of the longest-running student sections in the nation. And as well documented as Gonzaga's basketball history has been, the background of the Kennel Club had somehow slipped through. That's no longer the case with We Are G.U., a book written by a couple Kennel Club alums, published by GU alums, designed by Gonzaga professor Jeffrey Dodd and financed with help by Kennel Club sponsor Northern Quest Resort and Casino. During the 2017 tournament run, which saw Gonzaga make its first Final Four and National Championship appearances, Kennel Club alum and former Gonzaga basketball manager Aaron Hill was teaching abroad in Milan. He was working with a South Carolinian, and the two had a friendly back-and-forth before the Final Four matchup between the Zags and the University of South Carolina. "He made a comment, 'Glad we're not playing in Spokane in front of the rowdy Kennel Club and all those rugby players,"' Hill says. "And I knew the backstory that first, there's no rugby team at Gonzaga, and second, it was founded in part by the baseball team. So I shot a Facebook message to guys that I knew telling them that they should write their story down so there weren't incorrect facts out there." Hill was then directed to one of the Kennel Club's founding members, Mike Shields. Their original idea was a simple pamphlet of important details for incoming Kennel Club members, but gradually their story snowballed. Their research led to discoveries about the club in comparison to other student sections throughout the nation, learning that Gonzaga's section is older than vaunted sections like Duke's Cameron Crazies. "The Kennel Club is only second to the Orange Crush of the University of Illinois [in age]," Shields says. "Gonzaga's student body is roughly 6,000. You look at all the other schools — with the exception of Duke — the rest are 30,000 to 50,000 students." Gonzaga's club started in 1984, with Shields' friends and the baseball team (of which he was a student manager) wreaking havoc during the games and especially timeouts, long before the basketball team received any national attention. The Zags had never played in any postseason tournament and they were a middling squad in their conference year in and year out. "It was crazy," Shields says. "We literally went out on the floor whenever we wanted to. It was almost no holds barred. Interacting with players on the floor. Interacting with referees during timeouts." In We Are G.U., Shields details stories involving Kennel Clubbers messing with refs while wearing bags over their heads, or even spelling out "toupee" in front of a follicle-challenged coach's bench during one timeout. An interesting wrinkle to the book is seeing how the club and the university changed as the program progressed. Shields recalls having class with players like John Stockton and Bryce McPhee. During Hill's time at Gonzaga, most of the presidents of the club lived with guys on the team. That kind of intimacy between team and student body is rare for many top programs and a difficult thing to imagine continuing as Gonzaga's national profile continues to grow. 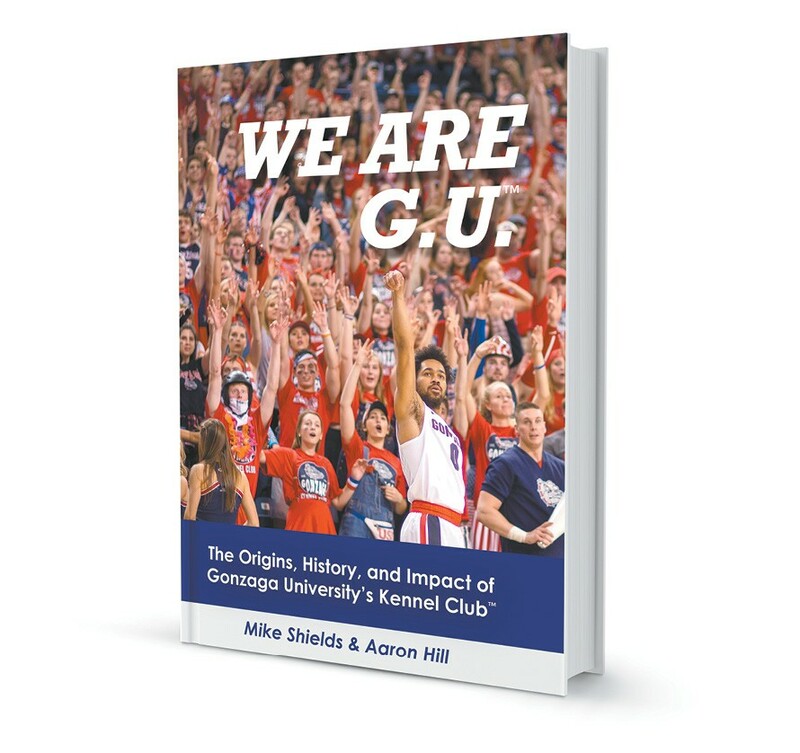 In the afterword of the book, Hill and Shields detail their hopes for the Kennel Club as Gonzaga remains in the national spotlight year in and year out. "Anything that grows has to evolve," Hill says. "The challenge for the Kennel Club will be to remain relevant as time goes on. The basketball team winning eventually goes stale, where once you're good, people take it for granted." During my own time at Gonzaga, there was some bemoaning of the regimented nature of the club or the expectations brought on by the university. It felt like something intended for underclassmen. It's the authors' hopes that the administration may give some leeway and creative opportunities to whomever is club president to freshen up a crucial experience for students. "Roughly half the student body is involved in this club," Hill says. "And it's really the only club when freshmen would meet juniors and seniors. Yeah, when you come to campus you meet a few people in your dorm, but some of the acculturation and growing up happens when you meet different people and older people. It's really the only forum for freshmen to meet seniors and form relationships that transcend the club." Shields and Hill hadn't met until well into writing the book together, but the commonality of being members of the club and students of the school bridged much of the gaps, be it age or location, between the two strangers. We Are G.U. is available at the Zag Shop both in person and online. The original print version of this article was headlined "Lifetime Membership"